Nine daring souls have ventured out on pilgrimage, the ancient pilgrimage route known as The Way of Saint James, or the Camino de Santiago. They are: Lindsey Cagle, Liliana Coraizaca, Brianna Gualtieri, Heidi Proper, Álvaro Sosa Suárez, Leejun Taylor, Tess Thapalia, Amanda Varno and Lindsey Wiehl. These students are completing classwork for Spanish 370 Experiential Spanish, a course that includes an immersion experience focusing both on language and culture. The students will walk an average of 25 km per day until they arrive in Santiago de Compostela. Along the way, they will engage in directed conversations and reflections, developing enhanced skills in conversational Spanish, while meeting pilgrims from around the world. 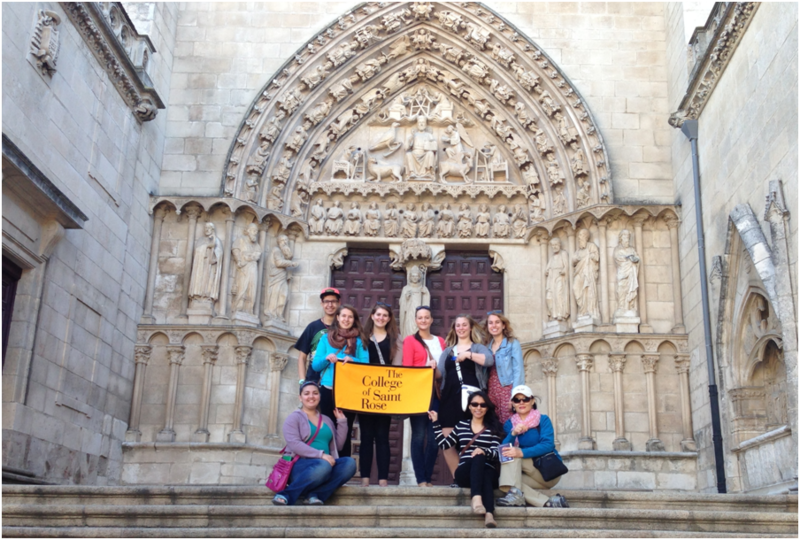 Saint Rose students and faculty abroad in Burgos, Spain. We are trying to focus on cultural difference as well as language learning in this class, and the driver’s tongue-lashing allowed me to reflect on a characteristic of the Spanish culture. When faced with a minor problem, it is entirely appropriate to complain loudly and declare that there is no possible solution to a problem. In past visits to Spain, I have protested back, or taken the castigation very personal, when in fact all I needed to do was sit back and let the complaints happen. In the end, things do get resolved, and it is nothing personal. It is simply how Spaniards respond to a problem, before resolving it. Case in point: the woman at the bus ticket counter, prior to boarding the bus. Our flight into Madrid arrived almost an hour early, and we passed through passport control and customs quickly. I approached the ticket counter to see if we could get on an earlier bus to Burgos, thus avoiding more “waiting in the airport” time. The woman at the counter looked at my tickets, and huffed and puffed, and told me since I had used PayPal to pay for them, there was absolutely NO WAY they could be changed. Ever. EVER. Period. Surprisingly, the bus was our most comfortable mode of transit, and the bus driver was wrong – there was plenty of room for my walking sticks and book bag! (It’s not personal, just cultural!) Although many heads were seen bobbing in and out of sleep, most students did wake up often enough to see the wind farms dotting the countryside as we journeyed north. This appears to be a fantastic group of students, not at all grumpy while dragging their own luggage into town. 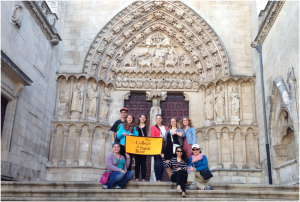 Even more telling – when given three hours of free time before class would meet in Burgos, not one student took a nap! In a country that venerates the nap! Instead they changed, showered, and hit the streets, anxious to discover more about the medieval city of Burgos. Today’s conversations are more challenging – the state of the monarchy, after suffering numerous public relations foibles; the economic crisis; the independence movement in Cataluña. The students will also be observing and describing different areas of the Cathedral, as well as visiting other churches in smaller groups. Finally, they will be setting individual, short-term goals that look to take their individual interests and relate them to the host country. We meet up later today at the old castle high above the city, offering a spectacular view down onto Burgos. After interviewing people in the streets. After the midday meal around 2, the heaviest meal of the day. And maybe after a siesta, too!